Cumberland House Natural History Museum located in Eastern Parade in Southsea allows you to find out about life, the universe and almost everything. You can join Mole and Ratty by the river and take a fish's eye view of the life on the riverbank. There is a display which allows you to watch the advance and retreat of the Ice Ages in the Ice Cave and to see a Polar Bear which lived here almost 70,000 years ago. A newer addition to the museum is their butterfly house which allows you to walk amongst the butterflies. There is also a life size model of a dinosaur inside as well as many other displays all housed in a large house dating from approximately 1830 to 1840 which is a grade 2 listed building. 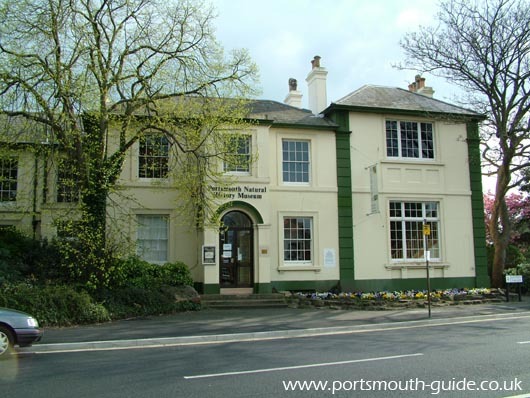 The museum tells the story of the wildlife of the riverbank, marshes, woods and urban areas of Portsmouth. Have a look for the heron stalking its prey and the brent geese coming into land after their flight from the arctic. You can also learn about Portsmouth's geology and take a look at the Victorian Museum exhibition. Behind Cumberland House located close to the Canoe Lake and The Rose Gardens is Portsmouth’s model village.